The attorney general was responding to a Trump tweet. In a rare move for the nation’s top law enforcement official, Attorney General Jeff Sessions is publicly pushing back against criticism lobbed at him Wednesday by President Donald Trump - the latest in a series of personal attacks. 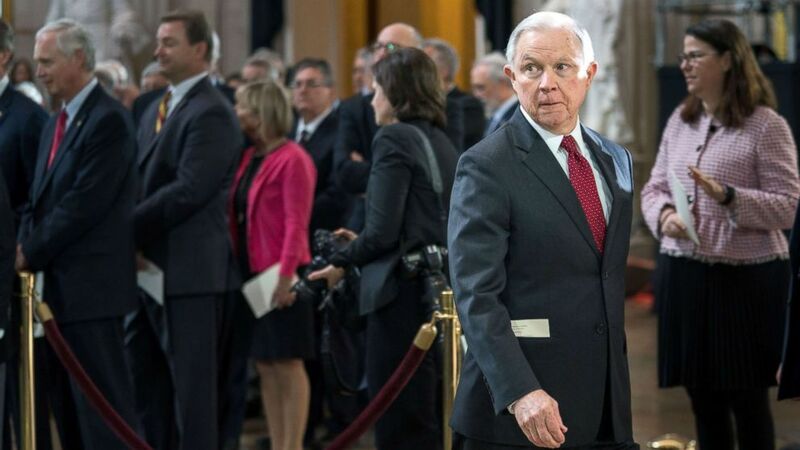 “As long as I am the Attorney General, I will continue to discharge my duties with integrity and honor, and this Department will continue to do its work in a fair and impartial manner according to the law and Constitution,” Sessions said in a statement issued Wednesday afternoon. Only hours earlier, Trump rebuked his attorney general on Twitter for referring Republican accusations of government surveillance abuses to the Justice Department's inspector general, rather than having the broader Justice Department investigate the matter. “Why is A.G. Jeff Sessions asking the Inspector General to investigate potentially massive FISA abuse. Will take forever, has no prosecutorial power and already late with reports on Comey etc. Isn’t the I.G. an Obama guy? Why not use Justice Department lawyers? DISGRACEFUL!” Trump tweeted Wednesday morning. At an afternoon event at the White House that took place after Sessions issued his statement, Trump ignored a question about whether he still had confidence in his attorney general. On Capitol Hill, Republican Sen. Lindsey Graham came to his defense. "I have a lot of faith in Jeff Sessions. What you see with Jeff is what you get. He’s a very decent, honorable man. And I think the president said some things quite frankly that are inappropriate," Graham said. "And I would encourage Jeff Sessions to stay in his job and to do it in the way he believes it to be- to do what’s right. I think he’s doing a good job." At issue is the Justice Department and FBI’s court-approved surveillance of former Trump adviser Carter Page. Within weeks of the FBI launching its broad investigation of Russia’s meddling in the 2016 presidential election and possible ties to Trump associates, federal agents obtained approval from the secretive Foreign Intelligence Surveillance Court (FISA) to monitor Page’s communications. (Erin Schaff-Pool/Getty Images) Attorney General Jeff Sessions attends a ceremony honoring Reverend Billy Graham as he lies in repose at the U.S. Capitol, Feb. 28, 2018, in Washington, DC. Rev. Graham is being honored by Congress by lying in repose inside of the U.S. Capitol Rotunda for 24 hours. Page was already on the FBI’s radar after being targeted in 2013 for recruitment as an intelligence source by Russian spies in a previous case. Earlier this month, the Republican chairman of the House Intelligence Committee released a memo - drafted by Republican staffers – accusing the FBI and Justice Department of “abuses” by relying on a controversial and unverified “dossier” about Trump to seek surveillance of Page. Last week, Democrats issued their own memo, insisting the surveillance of Page was appropriate and based on multiple streams of intelligence. Nevertheless, Republicans have been calling on Sessions to investigate the matter. On Tuesday, Sessions confirmed that he had referred the issue to the Justice Department’s inspector general.